07/03/2003: v1.6a: The program will now check for additional keywords during the crafting process and act accordingly if the item you are crafting is automatically cancelled. 07/03/2003: v1.6: PLEASE READ!!! A few setup changes have been made, please read the help section: Getting Started. Recompiled smartcraft.exe using a new version of the MacroScheduler program. With the recent crafting update included in the v1.63 patch of DAoC, I've modified the program slightly, as far as crafting multiple items. Now, when you craft more than one item, it will attempt to salvage after every item rather than waiting until the last item is made. The only reason it was done that way before was because of the multiple steps it takes for weaponcraft and armorcraft. Now that these crafts have been flattened to one step, there is no need to wait for multiple items to be crafted before the program attempts a salvage. The program will now look for "Your salvage is cancelled" in the chat.log. If it is found, the program will attempt to salvage the item again. This should fix an issue with the program not being able to continue when a salvage is canceled unexpectedly. Since there were a few people having trouble getting the program to start by pressing the * key, I've changed the start button to the SCROLL-LOCK key. Now, instead of bringing up the salvage window every time to salvage an item, the program will now just press 0 (zero) which is the slot you need to hot-key salvage. Read the help for more info if you do not know how to hotkey salvage on your toolbar. Special thanks go to these guys who made such a fabulous MMORPG with a completely mind numbing and frustrating crafting system that prompted the creation of this program, and many like it. This program allows you to continuously craft items in the game, Dark Age of Camelot, over and over until certain criteria are met, while you are away from the keyboard doing other, more productive things with your life. --That's the short description. I'm too lazy to write the long description. Before running SmartCraft for the first time, there are some preparations that must be made ahead of time. MAKE SURE you have the FIRST inventory bag open and you have a small amount if material necessary to create the item you are crafting in the FIRST inventory slot. For instance, when making a Stilletto, it takes 20 metal to craft, and when it is salvaged, it will yield 14 bars. 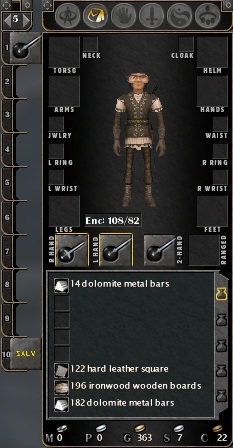 In this case you would want to place 14 bars in the FIRST inventory slot of the FIRST inventory bag as illustrated above. In all cases, you would want to position the salvaged material of the item you are crafting in this manner wether you are crafting weapons, bows or armor, always place the salvaged material in the first inventory slot before you begin. This is crucial for the program to automatically salvage the item for you. As for the remainder of your material (the stacks of 100+ metal, material, thread, etc), place it in any of the other inventory bags, preferably the last one. QuickBar Placement: SmartCraft will ALWAYS start crafting by pressing the item you have in the FIRST quick-bar slot. Once that item has been successfully crafted, it will then move on to the second item, then the third and so on. So always remember to drag your items in the order you want them crafted starting with the first slot on down. Salvage Button Placement: To hotkey Salvage, bring up your salvage window by selecting an item in your inventory. Press SHIFT-R, and while holding down the SHIFT key, Left-Click on the salvage button and drag the button to the 10'th slot on your menu-bar. Stop Crafting in an Emergency: You can stop the program at any time by pressing SHIFT-ESC. Windowed vs Full Screen: SmartCraft seems to be a lot more stable and predictable when you run DAoC in Full Screen Mode. You will also want to make sure all other programs are closed and if you have a problem with pop-ups, you'll definitely want to install a pop-up blocker. Basically, if DAoC looses focus, or is minimized, the program will not work. Time how long it takes to make the item you want to craft. Add 2-3 seconds to that number to accommodate for lag and enter that number in the "Craft Time" field. If you want to automatically salvage the item, time how long it takes to salvage it, add 2-3 seconds to that number and enter that in the "Salvage Time" field. Since we are only crafting one item, you would enter 1 in the "Items to Craft" field. If you want to stop crafting once you craft an item that is 99% quality or above, you would enter 99 in the "Quality" field. If you are just trinketing items to raise a craft, then you would obviously want to leave this field blank, or 0 (zero). If you want to stop crafting once your trade skill reaches a certain level, then enter that level in the "Craft Skill" field. Generally you'll want to do this if you are crafting to raise your trade skill level, and do not want to continue crafting once you've reached a certain level as not to waste materials crafting items that have become too low for you to raise your skill. Normally, you'll want to enter a number that is approx 20 below the next higher level item (when the next item turns orange). However, if you are trinketing to make money, you would normally care less about the trade skill level and want to craft until you run out of materials. If you want the program to log your char when the program is finished crafting, or you run out of materials, check the "Log when done" check-box. Make sure you have the correct path to the CHAT.LOG file, launch DAoC, load up on supplies, and click START! Trinketing: If you want to trinket, for example, a bridle, and a lantern to raise your leather and metalworking skills. Time how long it takes to craft each item you want to craft. Take the longest time, add 2-3 seconds to it for lag and enter that number in the "Craft Time" field. Enter 2 in the "Items to Craft" field, since we are crafting 2 items. Make sure the "Salvage Time" is set to 0 (zero) or is left blank since these items in this example can't be salvaged. Clear the "Quality" field or enter 0 (zero) in it since we could care less if we make a MP (100% quality) lantern. This program primarily uses the chat.log file for gathering information on the items you are crafting. When you begin crafting, the program will turn on the chat logging (so make SURE its OFF before you start the program) Press 1 to begin crafting the first item, wait the specified amount of time entered into the "Craft Time" field and turn off chat logging so DAoC will write out the log data to the chat.log file. Then the program will parse the file and check for a success, fail or if you ran out of materials, etc. If you successfully crafted the item, and there are multiple items to craft, it will move on to the next item and craft that item. After each item is crafted, it will then attempt to salvage the crafted item if there is a "Salvage Time" specified. The program will move the mouse over the recently crafted item, right click it, press 0 (zero - where you should have 'Salvage' hot-keyed). After the program waits the amount of time you specified in the "Salvage Time" time, it will then start back with the first item, and start the process all over again. Once you run out of materials, meet or exceed the specified trade skill level, meet or exceed the specified quality, the program will then stop crafting, and log the char out if you chose to do so. There is more to the program than just that (not much more) but that's it in a nutshell. This program is offered for testing and educational purposes only! The author(s) of this program assume no responsibility whatsoever for any damages this program, or the use of this program may cause. Use this program at your own risk and discretion. The authors take no responsibility for any actions Mythic Entertainment, Inc. may take against users of this program. This program does not, in any way, attempt to defeat or modify in game mechanics, save material costs, or speed up the time required to craft any specific item. Usage of this program legally releases the author against any claims of damages that may arise from the use of this program. I will not be held responsible for any items accidentally sold or salvaged in game or other losses incurred as a result of using this program. I've only tested this program on Fletching and Weapon Crafting. As soon as I get some time, I'll test out the remaining crafts and make adjustments to the program as necessary to make it work with all the other crafts. When crafting multiple items, you are forced to enter in the longest time, rather than specific times for each item. This isn't really a problem, more so an issue with efficiency as you are still waiting 30 seconds or more to craft an item that only takes 10 seconds. I'll probably add in multiple craft times for multiple items in a later version. I've only tested this with the Shrouded Isles expansion pack for DAoC running Windows 2000. I cant guarantee this will work with classic DAoC or on any other operating systems, although, it should. SmartCraft was written using Macro Scheduler Pro by MJT Net Ltd. Visit this page to download Macro Scheduler Pro and start writing your own scripts. This is a very powerful scripting program and was well worth the price for everything I've used it for so far.